Once the new year hits, the chart below is pretty close to what my portfolio with Robinhood will look like. I am going to put the "dividend capture" strategy on hold. I am going to buy these stocks that pay dividends and hold them. I currently have around $560, and below shows the stock total as $544.65. This total is with stock prices today, so I'm leaving some cushion room for prices to go up before January. I tried to pick these stocks so that I would get paid dividends every month. (The column for Dividend Payment Months - 1 = January, 2 = February, etc). I am also planning on adding money to my account on a regular basis in 2016. I will use the money that I'm adding, along with money from dividends, to buy more stocks. Also, I would like to own a share of Google in 2016. Right now, GOOG is ~$743, and GOOGL is ~$763. I gave myself 5 missions this past Sunday to complete over the week. A green Mission means it was completed, a yellow Mission means it was semi/mostly completed, and a red Mission means it was not completed. 90% of my Missions were completed this past week. I met with a friend at a local coffee shop, and I did not buy anything else on Black Friday. Investing - Compile a list of the companies I'm interested in investing in for the rest of 2015. I did compile a list, and even after this, I'm considering changing my investing strategy again. I went without my phone for 5 hours on Thanksgiving. I left my phone at home during my family's Thanksgiving and I really enjoyed it. I talked about this last night - Conservation Opportunities. Health - Don't be a pig for Thanksgiving dinner. I don't really know how I can measure/quantify this. Maybe I'll get 2 plates max of food, and only 2 desserts - 1 bar and 1 slice of pie. I kept to this limit, 2 plates of food and 2 desserts, but I still felt like a pig. Minimalism - Research document scanners. Review them for quality, price, user interface, and ability to upload/save documents to Dropbox or Google Drive. Investing - Plan my investing strategy for 2016. I don't think I'm going to try and do "dividend capture" anymore. 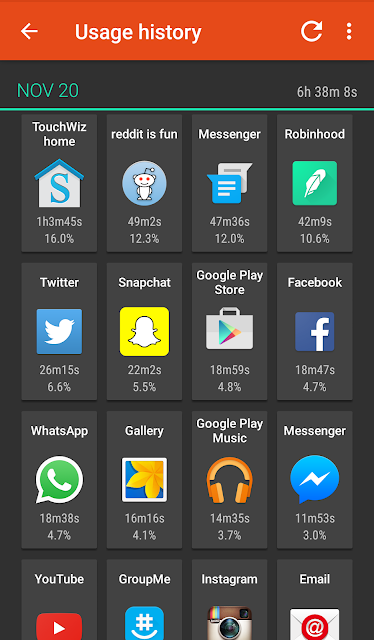 Technology - Look at the App Usage app to see which apps I'm using the most and see if I can live without these apps. Conservation - Reflect on No Shave November and how I conserved resources by growing a beard. Health - Drink only water after 5 PM, and drink at least a full bottle of water (33 oz/1000 mL or more) between 5 PM and when I go to sleep. Basically, if I'm going to drink coffee, juice, or pop, it needs to be before 5 PM. I finally got around to ordering the re-usable produce bags, and now I'm waiting for the bags to ship. I ordered them from ETSY, and like I've said before, this is my first time using ETSY, so I hope it's an overall smooth experience. Now with the produce bags ordered, I need to find something else to improve my conservation opportunities. I said in my Mission update this week I would look at the list from Lauren at Trash is for Tossers to get ideas. Looking at the list, a few ideas appear to be ones that I can do. I already have re-usable bags, but I could use a few more. With the holiday season coming up, I don't plan on buying or receiving a lot of gifts, but I could use newspaper for the gifts that I'll give to friends and family. My current cookware utensils are all plastic, and I should maybe get some new ones. Although, this isn't very "green", since I would then have to find a way to get rid of my current plastic cookware utensils. Lastly, I don't go through a ton of paper towels, but I always have some rolls in my kitchen cupboard. I don't think paper towels are all bad, but mixed in with other trash and in plastic garbage bags, it would make it harder for the paper towels to break down and decompose. I will probably make one of these 4 ideas a part of my Mission for the upcoming week. This was a shorter week for trading due to Thanksgiving and the shorter hours today. I sold a lot of stocks last week, and I didn't rush into buying stocks this week, although I did buy a few different stocks this week. This past trading week I sold my share of AT&T stock. To determine the % Gain, I used the following equation. =(Difference + Dividend + Fee)/Buy Price. I mentioned last week that I would maybe buy stocks that weren't paying dividends. I didn't hold this AT&T stock for very long, and I had a 1.35% return on it. It isn't reasonable to expect 5%+ gains on all of trades, and I am happy with any sort of gain. I am probably being bull-headed by holding on to my OHI stock, and I will incur "opportunity costs" by this bull-headedness. This "opportunity cost" means I could be using that money to buy other stocks and get positive gains from that. I've held OHI for this long though, that I feel like I can wait a little bit longer to break even on it. Below is a chart of what I bought this week. I bought KO, DIS, and WM for the upcoming dividends. I bought Twitter because I like it as a social media platform and I like the CEO, Jack Dorsey. Below is information on my year-to-date (YTD) investing numbers. Thanksgiving is my favorite holiday and it has been for some time now. It used to be an unspoken rule that everyone showed up for this holiday in my family, since usually someone was always busy during the other holidays. In the last couple of years, with new marriages and new jobs, this unspoken rule doesn't really hold much weight anymore. Regardless, I still love Thanksgiving. Today I left my phone at home and I felt great. There were a few moments where I instinctively reached for my phone during conversation gaps/transitions, but it wasn't there to grab. After the Thanksgiving main meal and while playing games in the afternoon, I realized how great it was to not have my phone. It was also great, because a lot of my family members weren't glued to their phones either. Towards the early evening, we looked at the black Friday ads. I did this out of tradition and just to see what was available. I did see some good deals, but again, it's not stuff I need. Tomorrow I am going to get some coffee with a friend at a local coffee shop, and that's probably the only thing I'm going to buy tomorrow. This upcoming holiday season, and for Thanksgiving next year, I need to do more to help those in need. I know there are many opportunities for me to help, and I just need to do it. I hope you had a happy and safe Thanksgiving. I will physically be with my family tomorrow. They are the most important people I would need to get in touch with by my cell phone. For family that won't be around tomorrow, they all live really far away. If I missed a call, I unfortunately wouldn't be able to assist/help anyways. Hanging out with some friends last night just reaffirmed how attached we are to our smartphones. A majority of my friends will be doing something Thanksgiving related tomorrow, and none of their days are going to be any more special than mine. (Call me Nancy, Negative Nancy). It will be a good test for me. I'm interested to see how I would feel/think/react not having it. Everyone else will have their phones for any potential emergencies/necessary calls. I'm not making any suggestions that anyone else do this, it's just something I'm thinking of doing. I also have the luxury of not traveling very far for Thanksgiving, so it's not like my phone will be completely out of reach. I can already expect a lot of Thanksgiving posts, tweets, snaps, and instagrams of food tomorrow. I don't need to be looking at other people's Thanksgivings while I'm participating in my own. I think a short recap at the end of the day will suffice. I've been trying to track how much money I spend at the grocery store. My grocery store receipt automatically breaks down the items purchased into preset categories, and I broke them down further where I saw fit. You can see the cart below. From the chart, which is a strawberry pie chart, that general groceries, dairy, fruit, and vegetables make up most of my cost. I tried to break down the general groceries category further, but it was becoming too difficult. The only thing I'm surprised by is my spending in the dairy category. In this category, I mainly buy cottage cheese, almond milk, cheese/shredded cheese, and sometimes yogurt. These don't seem outrageously expensive to me, so maybe it comes down to the quantity in which I buy these dairy items. I will sometimes buy 2 tubs of cottage cheese at a time, a couple bags of cheese, and occasionally buy two cartons of almond milk per visit. This data is only from 2 grocery receipts, so I will need more data. It'll be cool to look at trends and look for ways to be more cost effective. Tracking my grocery receipts in a spreadsheet will help me track my grocery spending, track trends in overall food categories, and track $'s spent/meal. I've already used this spreadsheet to track the cost of my tacos. It does take some time to enter the data in, and I'm not sure where my latest grocery store receipt went, but I like tracking this information. I went through the dividend calendar on the NASDAQ website and found stocks I'm interested in investing in for the rest of 2015. These stocks are shown below. Coca Cola has hovered around $40-ish dollars for awhile now, so I'm not too worried about the stock tanking. MCD is really high, so I probably won't end up buying that. I haven't bought Wendy's stock before, so that would be a new one for me. I know Waste Management is doing some good things with recycling. Dominos pizza is good, and their online ordering system is awesome. I was raised to love John Deere, so this isn't too difficult of a decision for me. I also may buy stocks that aren't paying dividends, and make money by buying low and selling high, but this is easier said that done. Keep in mind that the stock market is closed on Thursday the 26th due to Thanksgiving, and it will close at 1:00 PM EST (I assume EST) on Friday. My dividends for 2015 in my Robinhood account stand at $5.28, and I should be able to reach +$10.00 by the end of the year. 60% of my Missions were completed this past week. Minimalism - Donate/toss/recycle/sell 10 items. I am bringing back another full car-load from my house to my apartment, and I really don't have the space for everything. In order to complete this Mission, I was planning on having everything from my last trip to my house to my apartment, and that didn't even happen until today. I have plenty of stuff to complete this Mission, just didn't happen this week. Investing - Find out every service I have a recurring subscription for, analyze those subscriptions for usage, and consolidate this information on to 1 excel sheet. I'm looking for opportunities to save money. Technology - Remove 5 apps from my phone. Conservation - Finally order those re-usable produce bags. Completed - I ordered 12 bags off of ETSY. I feel good knowing they're being made by hand. I haven't used ETSY before, but so far it's been a pretty easy process. Health - Go to the gym Tuesday through Saturday. Monday's are too busy. 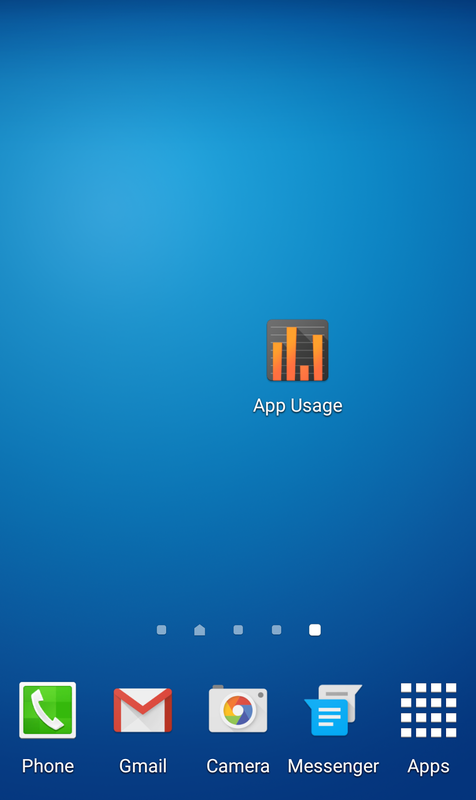 I downloaded an app called App Usage. It tracks how much time I spend on my phone and apps. (This is probably done anyways from the app makers and phone makers, this app just lets us see it too). I'm interested to see what apps are taking up the bulk of my time, and perhaps think about deleting it. I'm interested in also doing some statistics on it, and see if the Pareto Principle pops up. This would happen if approximately 80% of my time was used by 20% of my apps. You can see part of the app from the images attached. Friend: People are pumped, wanna relax, spend some dough. So there you have it, that was the reason the market was up today. This week I sold a lot of stocks, and did not buy any new ones. This past trading week I sold my shares of Ford, Intel, Johnson & Johnson, Microsoft, and Target. Ford has been an interesting stock for me. I like investing in it because I feel patriotic buying it. Since the stock price is lower, there isn't a ton of stock price swing, so it made it hard to average down and hard to sell it for a positive gain. I really hope they can keep up with Google and Apple with the self-driving cars. I don't have a lot of faith that the traditional automobile manufacturers will be able to keep up though. I got my first share of Intel at a good price, got a second share for the upcoming dividend, and sold while I was ahead. This was the same for JNJ and Microsoft, I bought at good prices, and sold after I got the dividends. I didn't hold my share of Target for very long, but knowing this stock, I wanted to quit while I was ahead, and I will also receive a dividend from from Target. I want to acknowledge that on JNJ and MSFT, I had 12.33% and 11.61% gains, respectively. I'm very happy with double digit gains. The overall gain was 6.86%, which I'm also very happy with. Did you get my Snap? No. No I didn't.